One of the most intriguing sixteenth-century tapestry sets belonging to the Patrimonio Nacional (the former Spanish royal collections) are the tapestries known as The Spheres. 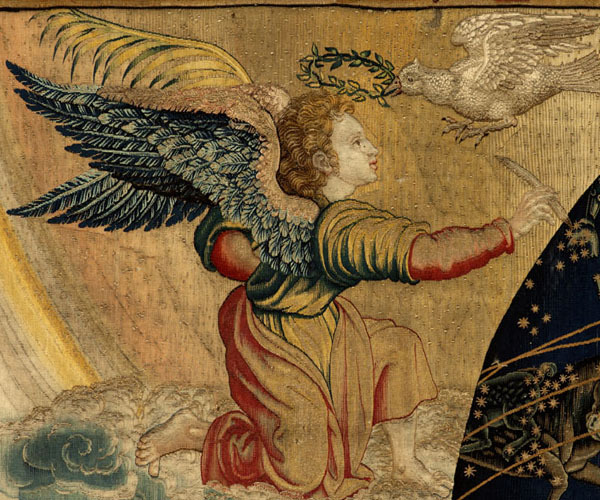 Three panels have survived from a cycle of five panels woven in Brussels before 1535. The design and conception of this set has traditionally been attributed to the Flemish painter Barend van Orley, an artist who created a number of significant tapestries for the Habsburg court in Brussels, in particular for his principal patrons, the Regents of the Netherlands, Margaret of Austria, and her niece and successor, Mary of Hungary. Pieter Coecke van Aelst is another Flemish artist proposed as the designer of the Spheres, who may have modeled his cartoons after detailed drawings sent to him from the Lisbon court possibly executed by Cristóvão de Figueiredo. The Spheres can be qualified as the most important tapestry commission ever undertaken by the Portuguese monarchs, King João III and his Habsburg spouse, Catherine of Austria, the youngest sister of the Emperor Charles V. This cycle celebrates the conquests, maritime feats and navigational innovations of the Portuguese during the Age of Discovery, and conspicuously honours Portugal and its overseas, trade empire which extended by the first half of the sixteenth century from Lisbon to Goa, and beyond to Macau. Three panels of the original commission — the Terrestrial, Celestial and Armillary Spheres — are still extant today. 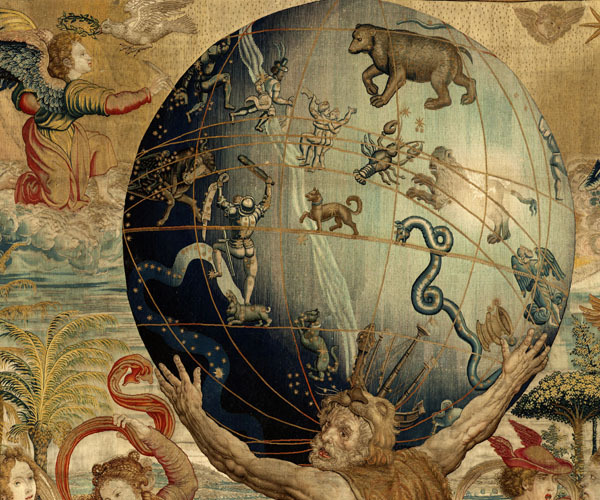 The imagery depicted in the Spheres cycle is complex, and in devising the pictorial program of these five panels, the contribution of humanists, scientists, cosmographers, mariners, cartographers and astrologers active at the Lisbon court are most evident. All the nautical, astronomic and scientific references, along with the symbolic details, and the spherical and armillary imagery underscore a Portuguese provenance. 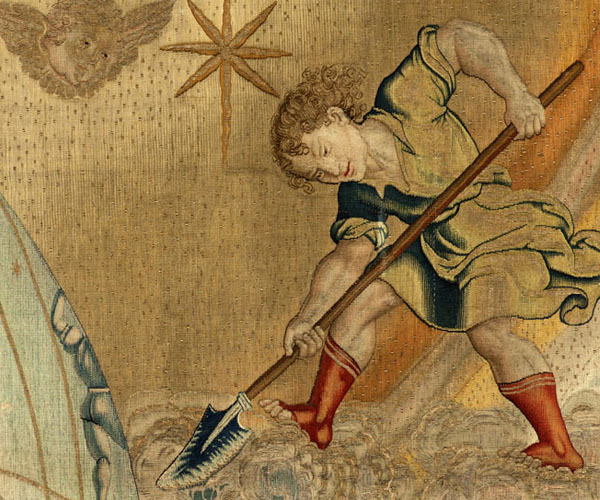 These tapestries spotlight Portugal’s contribution to cartography, navigation, astrology and commerce: achievements which thrust this small Atlantic kingdom into a pre-eminent global position in the early modern period. The depiction of the celestial sphere according to the Ptolomaic system in Panel Two: “Atlas supporting the celestial sphere”, indicates the series was definitively woven before 1543 when Nicolaus Copernicus published his heliocentric system of astronomy in De revolutionibus orbium coelestium. The Spheres remain an enigmatic commission. There is no information as to when the commission was given by the Portuguese monarchs João III and Catherine, or when it was carried out, or which artist (Portuguese or another nationality) conceived of the designs, and who executed the preliminary drawings (patrons). Nor is it known which Flemish workshop wove them in the Netherlands. An unidentified mark (or sigil) is visible on all three panels (right selvages). Joris Vezeleer (Georg Wezeler) (1493-1570)is thought to have possibly been the weaver, however, Vezeleer was more of an entrepreneur and merchant-dealer in Antwerp, rather than a weaver-manufacturer. The cartoons based upon lost preparatory drawings, were afterwards drawn by a cartonnier in order to fit the concept, format and size of each of the individual tapestry panels (each measuring over 3 meters in length). The larger cartoons for the Spheres have been simultaneously attributed to the Flemish painters, Barend van Orley and to Pieter Coecke van Aelst, without any conclusive findings. The Antwerp merchant-weaver Joris Vezeleer was probably the person responsible in the Netherlands in organizing the commission of the Spheres for the Portuguese court and for overseeing their production in Brussels. Little is known of his career. He began as a goldsmith and by 1519 had established his own studio in Antwerp. By 1524 he became dean of the gold and silversmith’s guild, before embarking on career as a merchant of luxury goods, financier and entrepreneur. He could have advanced the Portuguese monarchs, Catherine of Austria and João III the funds to finance the weaving of the Spheres. 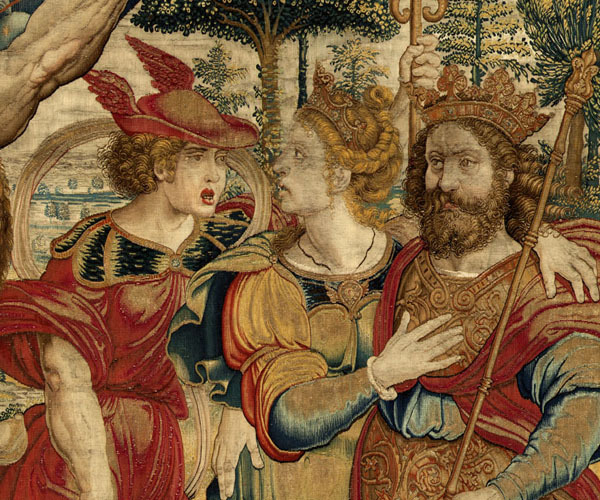 Recently, the Welser banking family, who acted as creditors and intermediaries in Augsburg for such expensive tapestry commissions on behalf of the Habsburg court, have been proposed as financiers of the Spheres for the Portuguese court but without conclusive documentary evidence. These tapestries are not documented in any contemporary Portuguese royal inventory but appear in Spanish royal inventories after 1580, supporting the hypothesis that the Spheres cycle was taken from the tapestry collections of the Lisbon royal palace to Spain in 1583 by King Philip II of Spain, after his two year residency in Portugal. The Spheres were documented along with other important Flemish tapestry cycles in the Alcázar palace in Madrid after 1598, selected as one of the inalienable heirlooms of the crown treasury and royal tapestry wardrobe. In 1659 the court painter Diego de Velázquez selected the Spheres to be part of the tapestry decorations in the reception hall (the Quarto de España) of the ephemeral pavilion erected on Pheasant Island in the Bidasoa river in honor of the marriage celebrations of Infanta Maria Teresa and Louis XIV of France. P. Junquera de Vega, “La Astronomia en los tapices del Patrimonio Nacional”, Reales Sitios, 10 (1973), pp. 17-28. P. Junquera de Vega and C. Herrero Carretero, Catalogo de Tapices de Patrimonio Nacional. Volumen I: Siglo XVI, Madrid, 1986, pp. 100-104. A. Domínguez Ortiz, C. Herrero Carretero and J. A. Godoy, Resplendence of the Spanish Monarchy. Renaissance Tapestries and Armor from the Patrimonio Nacional, New York, 1991. A. Jordan, “The Image of a King: Court Portraits in the Collection of Philip II”, Philippus II Rex, Madrid, 1998, pp. 383-436.